For a little over one year, I kept a journal. At the time, I had been practicing mindfulness for a while and figured keeping a journal could be a helpful daily exercise towards my practice and life in general. I already knew the power of writing. The way that writing from the heart, allowing everything to flow out of you as it will from thought or feeling to pen and then paper, can help calm the mind and bring clarity wasn't foreign to me. However, a journal was the opportunity to do that on an almost moment-to-moment basis. Sometimes, I'd recap the day at the end of the day. Other times, I'd jot down sentences as I was thinking or feeling something throughout the day. No matter how I did my journal for that day, a journal allowed me to start a dialogue within myself about what was going on within and around me. It helped bring clarity where there was none. In this way, it served as very much an extension of my mindfulness practice. A journal might not be for everyone. However, whether you think it will be a worthwhile exercise or not I suggest you give it a try at least once. So then, how do you do it? The rest of this post will detail the obvious questions of what kind of journal you should or can use and how to write in your mindful journal. What is work? What is play? Have you ever wondered what the difference is? And what's the value in questioning this in the first place? Generally, play is reserved for activities which have no greater meaning or purpose and work for activities which contribute to some greater goal or agenda (actions which do have a greater meaning or purpose). However, even that's a misconception. I got an email from ABC Mouse recently, an online learning program we use for our oldest son, and it had that quote at the top of the email. This misconception of play not having worth exists not just for children, but for adults too. We think that as adults we have to live seriously. We think that our work and responsibilities are serious business. But we've forgotten the value of play. Or, more specifically, living with the perspective of play. When we're children, play is all we do. Even when we're in the midst of sincere pursuits (as serious or sincere as a pursuit can be for a child) such as playing sports we still do so in the spirit of play. However, we get older and start chasing a sense of meaning and purpose because we feel the illusory void within our heart and mind more heavily, and as a result, begin to search for a way to fill it up. This leads us to forget about play and become immersed in "serious" pursuits that require more "work" and less "play time". At least, that's what we think. However, this void is just that- it's an illusion- and so nothing we do will fill it up. "Are you saying then that this search for meaning and purpose is also an illusion?" Yes, I am. It's been more than 6 months in the making, but my new book, This Moment: How to Live Fully and Freely in the Present Moment, is almost here! The book is now available for pre-order at ThisMomentBook.com and pre-orders have already begun rolling in. I couldn't be more excited to bring the book to you, it turned out far better than I had originally imagined. The book is huge, roughly 50% larger than my last book, Zen for Everyday Life, which was big in itself. In the book, I cover every important principle I've found from a combination of my study of the world's wisdom traditions, life, writing and working with so many of you here on Buddhaimonia, and through my personal practice. I leave no stone unturned and no question unanswered, at least as best as I feel I can answer right now. In it, I cover what I consider to be the four major principles for the realization of "it". That is, what we all want- peace, freedom, happiness. However you choose to describe it, they're all different shades of the same thing. The basis for the book is the realization that there was more at play to the path of living peace and happiness than just mindfulness. As my practice began to develop, and as I continued to write here and talk with so many of you, I noticed certain key principles emerge that were just as important as mindfulness. It was then that I began piecing together this more "complete" practice for walking the path to peace and happiness. 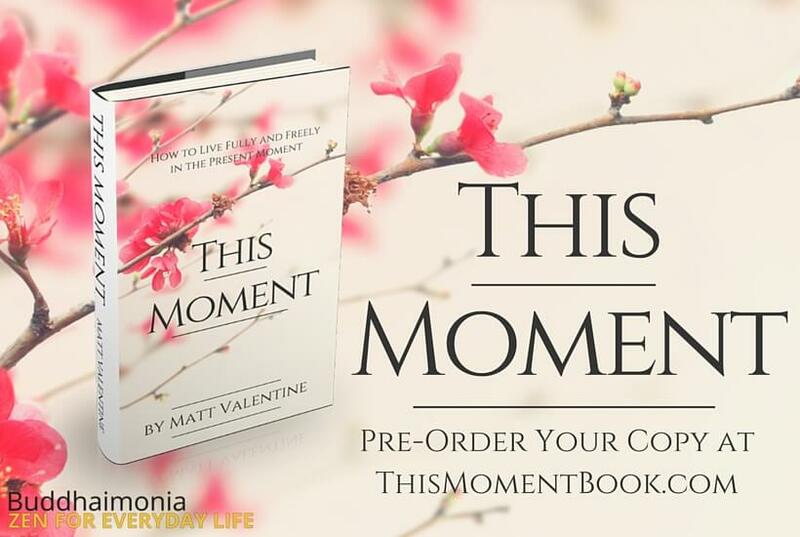 The book will be officially released on February 29th (next Monday, as of the day this post will go live), but you can pre-order it now by going to ThisMomentBook.com. You can also check out the different editions (including eBook, paperback, and you can even get the audiobook, plus a lot of cool bonus material to take the book even further), learn more about the book, and get 2 free sample chapters there as well. Thank you to everyone who has supported the book so far, I deeply appreciate it! Be on the lookout for This Moment February 29th!